You can access the Notes Category Manager by clicking on the 'User Note Categories' item in the Users menu in the back-end. This screen allows you to look at a list of your user note categories and sort them in different ways. 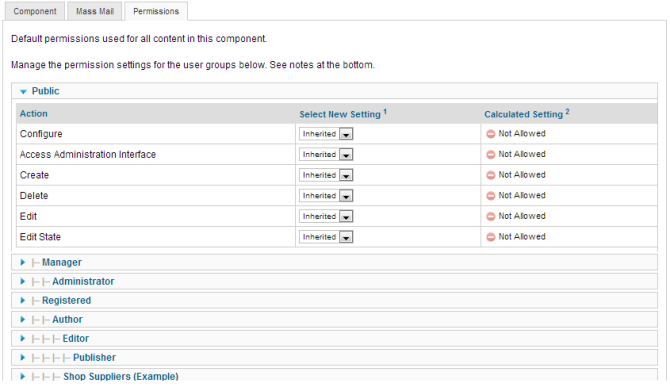 You can also edit and create user note categories and access levels. In the table containing the user note categories from your Joomla! site, you will see different columns. Here you can read what they mean and what is displayed in that column. Click on the column heading to sort the list by that column's value. The list will be sorted in order by that column and a sort icon will show next to the column name, as shown below. Click a second time to reverse the sort to high-to-low. The sort icon will change to high-to-low, as shown below. New. Opens the editing screen to create a new note category. Edit. Opens the editing screen for the selected note category. If more than one note category is selected (where applicable), only the first note category will be opened. The editing screen can also be opened by clicking on the Title or Name of the note category. Publish. Makes the selected note categories available to visitors to your website. Unpublish. Makes the selected note categories unavailable to visitors to your website. Archive. Changes the status of the selected note categories to indicate that they are archived. Archived note categories can be moved back to the published or unpublished state by selecting "Archived" in the Select Status filter and changing the status of the note categories to Published or Unpublished as preferred. Check In. Checks-in the selected note categories. Works with one or multiple note categories selected. Trash. Changes the status of the selected note categories to indicate that they are trashed. Trashed note categories can still be recovered by selecting "Trashed" in the Select Status filter and changing the status of the note categories to Published or Unpublished as preferred. To permanently delete trashed note categories, select "Trashed" in the Select Status filter, select the note categories to be permanently deleted, then click the Empty Trash toolbar icon. Rebuild. Reconstructs and refreshes the relevant table. Normally, you do not need to rebuild this table. This function is provided in case the data in the table becomes corrupted. 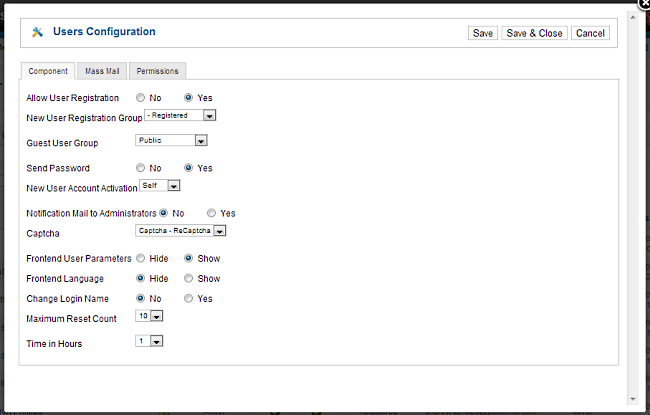 Click the Options button to open the User Manager Options window which lets you configure this component. Save. Saves the user options and stays in the current screen. Save & Close. Saves the user options and closes the current screen. Allow User Registration. (Yes/No) If set Yes, users can register from the front end of the site using the Create an Account link provided on the Login module. If set to No, the "Create and Account" link will not show. New User Registration Group. The group that users are assigned to by default when they register on the site. Defaults to Registered. Guest User Group. The group that guests are assigned to. (Guests are visitors to the site who are not logged in.) This is set to Public by default. If you change this to a different group, it is possible to create content on the site that is visible to guests but not visible to logged in users. See Allowing Guest-Only Access to Menu Items and Modules. Send Password. If set to yes the user will be emailed their password on the registration email. Note there are potential security issues if this is set to yes. None. User account will be active immediately with no action required. Self. User will receive an email with an activation link. The account will be activated when the user clicks the activation link. Admin. User will receive an email with an activation link. When the user clicks this link, the Site Admin will be notified via email and the Site Admin needs to activate the user's account. Notification Mail to Administrators. 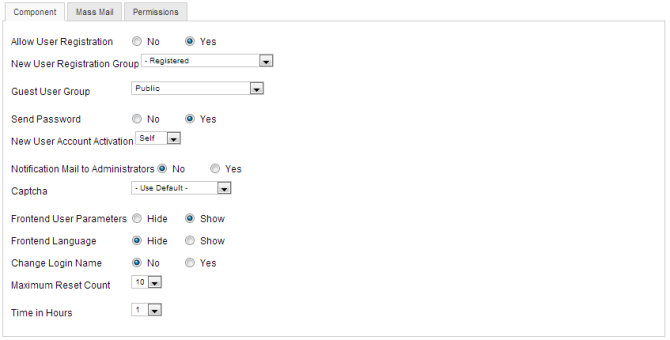 (Yes/No) Send email notification to administrators with User Account Activation. Captcha. Use Captcha for User Account Registration and Username or User Password reminders. Frontend User Parameters. (Show/Hide) If set to Show, users will be able to modify their language, editor, and help site preferences from the front end of the site. If set to Hide, the user will not be able to change these settings. Frontend Language. (Show/Hide) Show or hide the option for users to set their default site language. Change Login Name. (Yes/No) Allow user to change Login Name. Maximum Reset Count. (0-20) Maximum number of reset password attempts per Time in Hours. Zero means no limit on reset password attempts. Time in Hours. (1-24) Time period in hours for the Maximum Reset Count. Subject Prefix. Enter optional text to be inserted automatically before the subject of the mass email. Mailbody Suffix. Enter optional text to be inserted automatically after the body of the email (for example, a signature). Change an users state (Publish, Unpublish, Archive, and Trash) in the component. 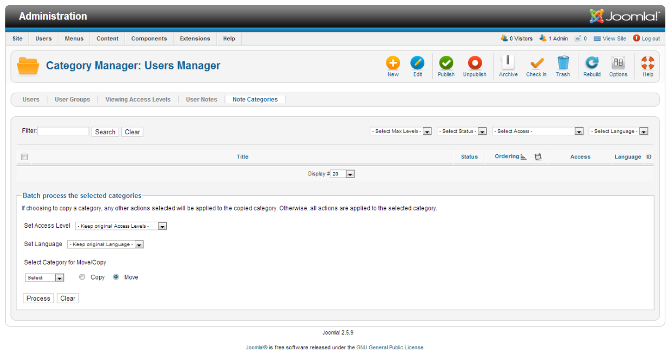 Above the column headers are a series of controls that let you limit what items show in the user note category manager screen. More than one filter may be entered. In this case, only items that meet all of the filter conditions will show on the list. Filter by Partial Title or ID. In the upper left is a filter field and two buttons, as shown below. This section allows you to change settings for a group of selected items. The fields are as shown below. You can change one value or all three values at one time. 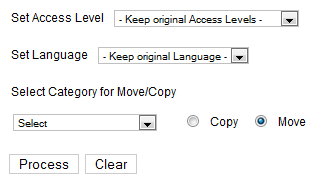 Note that if you copy items to a new category, changes you have selected fro access level and language will be applied to the copies, not the original. Select one or more items on the list by checking the desired check boxes. To copy the items to a different category, select the desired category from the category list box and check the Copy option. In this case, the original items are unchanged and the copies are assigned to the new category and, if selected, the new access level and language. To move the items to a different category, select the desired category from the category list box and check the Move option. In this case, the original items will be moved to a new category and, if selected, be assigned the new access level and language. Note that nothing will happen if you (a) don't have any items selected or (b) have not selected an access level, language, or category. This page was last modified on 1 March 2013, at 05:18.